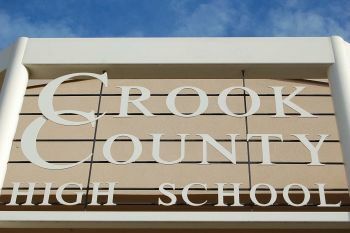 PRINEVILLE, OR -- Attendance was down at Crook County High School, after a threat discovered in a bathroom said there would be an incident on Monday. "Last week, we had a student that did some vandalism in a restroom, making a threat towards the high school," Principal Michelle Jonas tells KBND News. "In partnership with law enforcement, we asked that there would be an increased presence. They responded and, not only did it increase a presence here, but at all the schools in Crook County." Jonas says the vandalism is being investigating but there are no leads on a suspect, despite social media rumors that alleged a student had been caught and expelled; one post incorrectly claimed all Crook County Schools were in lock-down. "We’ve just been emailing out parents and putting things out on our Facebook page," says Jonas. "In our email to parents just saying, ‘Hey, there are a lot of rumors going around out there. When at all possible, check our Facebook page or give us a call.’ We’ve had a lot of calls from parents and emails from parents, just so that we can help stop that rumor mill." While Jonas heard from some parents who were concerned enough to keep kids home Monday, she says students who were there felt safe. "Having an increased presence, making the kids feel like there’s people watching. This day and age, you have to take all these threats seriously and just investigate them – talking to kids who might have any information, and just investigating to the best of our ability." She acknowledges it's not an incident they've seen much of in Crook County, "We’ve been fortunate that we haven’t had a lot of this type of behavior here at our school, so just kind of looking and seeing what other schools have done and what we can look to improve."